We have been acculturated for years to believe that most healing products must be based on chemistry – pills, injections, topical creams. Big Pharma is all about making sure we continue to believe this – Americans now reportedly spend around $200 billion a year on prescription drugs, and that figure is growing at a rate of about 12 percent a year. In the new paradigm we are entering, healing products are increasingly based on physics, that is vibratory resonance of one sort or another. If you’ve ever had an MRI, CT scan or used a bone growth stimulator, you’ll see these kinds of energy-based modalities are indeed making it into the main stream. 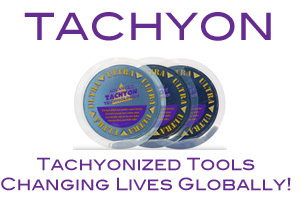 Tachyon products can reduce radiation exposure from EMFs emitted in your home and workplace from appliances, computers––from anything that emits electricity. Research has proven and experts report that, in most cases, Tachyonized tools actually resolve the EMF issue. Tachyonized disks have been sold to users and companies in over 156 countries. They are the standard worldwide. I have been using Tachyon discs in my home for 15 years now – an array over the fuse box, one behind the computer, a mini on my smartphone, as a coaster on the nightstand for my glass of water and under any vase of cut flowers. 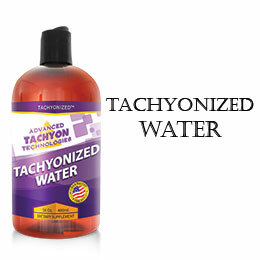 My other favorite Tachyon product is Tachyon water. I’ve seen a dropperfull in a vase rejuvenate nearly dead flowers. I also take it – a little at a time – orally.